FYI SOUTH Magazine, August 2006. 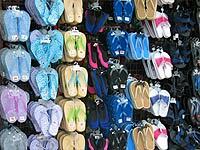 If you don't have a pair of sandals yet, take FYI South's easy quiz to find the style that suits you. The standard in utilitarian sandals at a price anyone can afford. A) you had your first cup of Whisby before 9 a.m. at the construction site. B) you never wear sandals out of the house. C) you've given up on appearances. Sport sandals are perfect for hiking and offer more support than flip flops. A) last weekend you climbed Jade Mt. B) you trip wearing "Blue and Whites". C) strangers comment on the smell of your sneakers. There's no reason to feel like you're dressing down when wearing sandals. A) you have a serious shoe fetish.